At least 20 persons, including 12 policemen, were injured in a clash last night between the police and villagers protesting construction of a boundary wall near Indira Gandhi International Airport. The Labour Department of the Delhi Government directed all restaurant owners, dhabas, industries etc today on the eve of International Anti Child Labour Day not to employ children in their establishments. The Haryana State Industries and Infrastructure Development Corporation has decided to appoint a private security agency for the security of industrialists and their goods in Udyog Vihar. Resident Welfare Associations in East Delhi have welcomed the direction of registrar of societies to 30 group housing societies that the sanitation work would be carried out by the MCD. Delhiites today woke up to a pleasantly cool morning with fresh gusts of easterly winds bringing much needed relief from the searing heat conditions during the last few days. A court here has dismissed the anticipatory bail plea of a Delhi-based businessman accused of siphoning off Rs 58 crore from the National Agricultural Cooperative Marketing Federation (Nafed) in connivance with its senior officials. A psychiatric patient, accused of lifting a scooter nine years ago, was acquitted of theft charges by a court here, saying that he was incapable of knowing the consequences of his act. Cricketer Yuvraj Singh was granted bail by a local court today in a case in which he, his mother Shabhnam Singh and seven others were accused of beating and wrongfully confining Yuvraj Sidharat and his mother Neelam Mahajan on the night of December 12-13 last year. In order to provide mountaineers with weather details and automatic weather warnings, the Indian Mountaineering Foundation is setting up an Integrated Sensor Suite, a warning and recording system that includes a microprocessor controlled lightweight weather station at the Chhota Shigri glacier in Himachal Pradesh. A devastating 4 for 41 bowling spell by Mayank Sethi helped G.G.Dutt Club defeat Malik Sports by eight wickets in the Rs 5 lakh prize money Delhi and District Cricket Association Hot Weather Cricket Tournament at the RSKP ground here today. Chairman, Standing Committee ,MCD, Vijender Gupta today inspected the ongoing desilting work of storm water drains in Civil Lines, Rohini and West Zone areas of Delhi. He was accompanied by Deputy Chairman of Standing Committee, Yogender Chandolia and members of the committee. Delhi Finance and Urban Development Minister A. K. Walia and Power Minister Haroon Yusuf have asked senior officers of the BSES to take corrective measures immediately as number of frequent breakdowns and long interruptions in power supply has gone up in East Delhi and especially in the Geeta Colony assembly constituency. Indira Gandhi National Open University's School of Law will start imparting legal education through distance mode, Vice-Chancellor V. N. Rajaskekharan Pillai said today. At least 20 persons, including 12 policemen, were injured in a clash last night between the police and villagers protesting construction of a boundary wall near Indira Gandhi International Airport. The police had to fire 12 rounds in the air to control the mob, which turned violent in its protest against the construction of a boundary wall which they claimed would block off an access road for them. Seven persons were arrested for fomenting trouble and obstructing traffic. A case was registered at the IGI police station soon after the incident, according to sources. Residents of Shahbad village in the Mohammadpur area pelted stones when the police tried to stop them from razing the boundary wall. They set afire a truck carrying construction material to the site in Shahabad village. "After stone-pelting left several policemen injured, a mild lathi charge was resorted to but after that failed to have the desired effect the police fired 12 rounds in the air," the source said. As many as 12 policemen were injured in stone pelting, he added. Demonstrators later squatted on the railway track on the Delhi-Jaipur route affecting traffic on the line, besides blocking traffic on the airport road. The situation was still tense and additional police personnel had been deployed to maintain law and order in the affected area. The police had rounded up several persons after the violence and a case of rioting had been registered against them, said a senior police officer. In the meantime, a mahapanchayat was organised in protest against police action over innocent villagers of Shahabad. Under the leadership of the sarpanch of the village, Ram Karan Solanki, they gave a memorandum to the Lieutenant Governor of Delhi and demanded compensation for injured villagers in the incident. 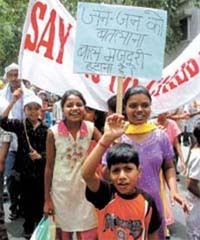 It also took out rallies against child labour employment. Members of trade unions of the trans-Yamuna area, office bearers of co-operative group housing societies of Patparganj and NGOs took part in the awareness rally. Handbills and pamphlets were distributed. Posters and banners were displayed throughout the way. Deputy Labour Commissioner, East and North-East Delhi, K. R. Verma, said the government was concentrating in the trans-Yamuna area because in these areas children worked in factories. Small industries were there in unauthorised colonies where children worked. Rallies were organised in various localities to create awareness among factory owners and others. The Haryana State Industries and Infrastructure Development Corporation (HSIIDC) has decided to appoint a private security agency for the security of industrialists and their goods in Udyog Vihar. Entrepreneurs of the area have a mixed response to the HSIIDC's step as Rs 50 lakh, which would be incurred for security cover annually, would be charged ultimately from the entrepreneurs of the area. Official of the HSIIDC informed a private agency would hire 41 personnel for providing security in Udyog Vihar. The service would be inaugurated on June 14. This step had been taken to ensure the smooth flow of traffic movement, systemise reri vendors and provide security to entrepreneurs. He further added traffic movement had increased manifold in the area during the past few years because of new call centres and the IT sector. However, the president, Chamber of Industries of Udyog Vihar, Col Raj Singla, informed the salaries of the entire staff of 90 personnel employed by the HSIIDC in Udyog Vihar and other bills like TA, local conveniences, telephone, office maintenance, postage, computer maintenance and office contingencies etc amounted to about Rs 285 lakh annually. These were being charged from entrepreneurs of Udyog Vihar as maintenance charges. Earlier also, the HSIIDC had similarly obtained the services of a private agency for providing fire services and an expenditure of Rs 18.90 lakh was being charged from entrepreneurs every year, said the president. Colonel Singla asserted HSIIDC officials had put all rules and regulations at bay as the Supreme Court of India, in a recent judgement, had held taxpayers could not be burdened with government employee salaries. There was a strong feeling among entrepreneurs the HSIIDC was adopting the methodology of appointing staff through security agencies so that it could continue to make recovery from entrepreneurs in the name of providing security in the area, alleged Singla. The HSIIDC was proposing similar arrangements in all other industrial estates in Haryana, added the sources. Resident Welfare Associations (RWAs) in East Delhi have welcomed the direction of registrar of societies to 30 group housing societies that the sanitation work would be carried out by the MCD. As per the notice issued by registrar of co-operative societies, these housing societies had achieved their objective by allotting plots and transferring their basic services to the MCD. "This was a long standing demand of residents .Most of these house building societies ,including Suraj Mal Vihar, Kiran Vihar, AGCR, Priya Enclave, Gagan Vihar, Defence, Rajdhani Enclave had came up in the early seventies. After allotting plots to the members their role was over three decades ago. There are about 42 house building societies in East Delhi. Almost all of them have passed on the charge of their essential services to the MCD in early nineties", said V. N. Bali of the Ram Vihar RWA. S. K. Chibber, Editor ,Corporate Era, a magazine on co-operatives said "world wide co-operatives cease to exist after the plots are handed over to its members, after this the resident welfare association ( RWA) takes care of all residents, including tenants and general power of attorney holders". The kiss of the easterlies brought about a slight drop in the minimum temperature to 30.3 degree Celsius from 31.5 degree C yesterday. Though humidity levels remained high at 45 per cent, the drop in mercury, coupled with a cloud cover over the sky, nevertheless brought some respite to the people from the intense heat wave that has been sweeping the Capital since the beginning of this month. The Met Office said the coming days could bring further relief from the scorching heat with the weatherman forecasting duststorms and thunderstorms over the next few days. "With the change in wind pattern from westerly to easterly direction over the Indo-Gangetic plains and the possibility of duststorm/thunderstorm, maximum temperatures are likely to register a decreasing trend over the plains of northwest India, including Delhi, during the next two to three days, leading to abatement of prevailing heat wave conditions", 'the weather office said. The Met Office has forecast a partly cloudy sky during the next 24 hours with the possibility of duststorms and thunderstorms towards the evening. They have also forecasted a drop in the maximum temperature. A court here has dismissed the anticipatory bail plea of a Delhi-based businessman accused of siphoning off Rs 58 crore from the National Agricultural Cooperative Marketing Federation (Nafed) in connivance with its senior officials. "Considering the fact that a huge amount has been siphoned off and his custodial interrogation is required in the matter, I am not inclined to grant anticipatory bail to the petitioner", Additional Sessions Judge S N Gupta said, rejecting Lalit Mohan's bail plea. Earlier, NAFED counsel Ajay Digpaul, opposing the bail plea, said an initial probe had revealed the involvement of several senior Nafed officials and Mohan's interrogation was necessary to take the investigation to its logical conclusion. The court dismissed Mohan's contention that the criminal case against him be stayed as a litigation, an off-shoot of arbitration proceedings between Nafed and his company on the same issue, was pending in the Supreme Court. Arbitration proceedings, which had been stayed by the Supreme court, were of civil nature and the criminal proceeding had not been stayed, the court observed. Mohan had been evading arrest since an FIR under various sections of the IPC, including 406 (criminal breach of trust), and 420 (cheating), was filed against him this year. The police said Mohan, the proprietor of the Khari Baoli-based agro-produce company Roshan Lalit Mohan, had entered into an agreement with Nafed, a cooperative society, seeking financial assistance of up to Rs 100 crore. The aid was sought for purchasing dry fruits, spices and other products meant for export on July 5, 2004, the police said. Mohan took financial support from Nafed to the tune of Rs 58 crore and deposited several post-dated cheques, many of which dishonoured, the police alleged. At the time of the incident, the accused, suffering from schizophrenia, was unaware of the consequences, so no motive could be attributed, Metropolitan Magistrate Digvijay Singh said. The court acquitted Rajesh Singhal, a resident of Rohini, of the charges under Sections 379 (theft) and 411 (receiving stolen property) of the IPC, noting that the basic ingredient of dishonest intention required in a theft case was lacking in the accused. The case fell under Section 84 of the IPC which provided that nothing was an offence if a person, who, at the time of doing that, by reason of unsoundness of mind, was incapable of knowing the nature of the act, the court said in the recent order. Singhal was arrested on June 23, 1998, while stealing a scooter belonging to Suresh Sharma outside his house in Punjabi Bagh here. The court, after examination of several witnesses, noted there was no doubt that Singhal had removed the vehicle but records revealed he was a psychiatric patient. He was even unable to tell his name at the time of his arrest. No alcohol had been detected in the medical reports of the accused. It appeared the complainant misunderstood the psychiatric ailment of the accused as intoxication, the court said. Ranjana Aggarwal, Judicial Magistrate (First Class), granted him the bail and directed his counsel could appear on his behalf for the next hearing on August 18 for further proceeding of the case. Shabhnam Singh, mother of Yuvraj, informed the latter appeared before the court and prayed that he might be granted bail as he had to play international cricket and thus could not appear in the court regularly. However, complainant Neelam Mahajan said she had complete faith in the judiciary and was sure the culprits would be punished. In order to provide mountaineers with weather details and automatic weather warnings, the Indian Mountaineering Foundation is setting up an Integrated Sensor Suite (ISS), a warning and recording system that includes a microprocessor controlled lightweight weather station at the Chhota Shigri glacier in Himachal Pradesh. The system will be installed within this year for which a sighting team is visiting the area in June. The Integrated Sensor Suite is a microprocessor controlled, compact, lightweight weather station that will update the climbers and rescue teams with essential data on temperature, humidity, solar and ultraviolet radiations, wind velocity and direction and rain gauge. The system also includes a solar panel to power it and a data logger that can record sensor data worth six months for retrieval later. Thus, it can be left unattended for six months. The recorded data will help in generating crucial real time data with regards to global warning and climate change at the glaciers. A devastating 4 for 41 bowling spell by Mayank Sethi helped G.G.Dutt Club defeat Malik Sports by eight wickets in the Rs 5 lakh prize money Delhi and District Cricket Association Hot Weather Cricket Tournament at the RSKP ground here today. Scores: Malik Sports: 146 (Jitender Pal 36, Rohit Saini 34, Mayank Sethi 4 for 41, Amolak Singh 2 for 17). G.G.Dutt: 148 for 2 in 20.4 overs (Amar Singh 85 n o). Subhania Club defeated Kranti Star by six wickets at the Ferozeshah Kotla ground. Scores: Kranti Star: 162 (Naveen Gehlot 39, Ajit Gulia 3 for 27, Hitesh Gemini 3 for 28, Jitender Gulia 2 for 20). Subhania: 166 for 4 (Kamal Beniwal 51, Jitender Gulia 35 n o, Imran Khan 29, Prashant Gupta 2 for 29). Three Star by 29 runs at the Guru Gobind Singh College ground. Sonnet Club beat Turf Academy by three wickets in a league match of the Bishnoi Cup Cricket League at the Modern School ground. Scores: Turf Academy: 144 for 6 in 35 overs (Unmukt Chand 42, Bhavya Bishnoi 40, Nitin Yadav 30, Dron Chabra 2 for 29). Sonnet: 145 for 7 (Kartik Sehrawat 53, Nitish Rana 32, Harshit Kuar 3 for 18). He appreciated the efforts of engineering department in cleaning the drains. At some places machines were used. The committee inspected Shakti Nagar, Wazirpur Industrial Area Block-B and C, Moti Nagar, Rajouri Garden, Subhash Nagar and Janakpuri. Gupta directed the officials concerned to hire super- sucker machines meant for desilting of drains so that the desilting work was completed by June 30. Inspecting the desilting work of Moti Nagar drain, he said that the drains of MCD open into the major drains of the Irrigation and Flood Control department of Delhi government. If its drains were not cleaned, desilted before the onset of monsoon, the MCD labour done would be of no use. Walia has further instructed the BSES to install transformers and L.T. Cables as per plan prepared for 2006-07. Non-commissioning of planned transformers and L.T. cables has resulted in large number of complaints. "The law school will also start planning the development of a four-year LLB course and efforts will be made to get the recognition of the Bar Council of India", he said. It has prepared an ambitious five-year plan for a number of programmes that include development of material for training of subordinate judiciary, continuing legal education for new teachers, MPhil and PhD programme and creating a culture of legal research in the country. Law School Director Srikrishna Deva Rao said the school would start preparatory work for the development of postgraduate programme in law with inter-disciplinary courses of international relevance and three-year BA programme in law to create legal awareness. A teenage girl, who works as a domestic help, claimed she was raped in a South Delhi locality last night. The 17-year-old girl filed a police complaint this morning that she was raped in a tennis court in Katwaria Sarai area. The Hauz Khas police has registered a case in this connection and claimed to have arrested three persons.